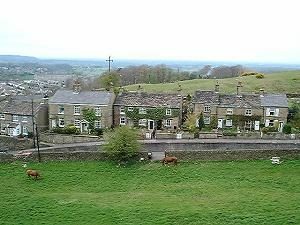 From its junction in the middle of Kerridge with Jackson Lane and Oak Lane, Redway extends about 200m up a gentle slope with fine examples of local stone cottages along one side looking out over a small valley of green fields, stone walls and tree lined Kerridge Hill beyond. Approach off Jackson Lane, Oak Lane, Windmill Lane. Pedestrian path across the fields to Chancery Lane, Cow Lane and Lord Street, Bollington, and to Kerridge Hill and White Nancy. Pedestrian path across a field to Higher Lane. Nearest pub – Bull’s Head. The cottages at the top of the lane (white fronted in the picture left) were the Redway Inn before conversion back into cottages in the early 21stC. To the right of the cottages is a track leading to Kerridge Hill (pedestrians only) and White Nancy. To the left is a paved path to Bollington. 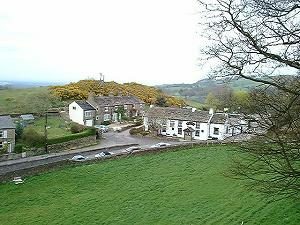 There are many footpaths in Kerridge, particularly between the village centre and the quarries along the hillside. All of these paths are paved with stone. They were heavily used when the quarries were at their peak, with large numbers of quarrymen walking to and from their work. 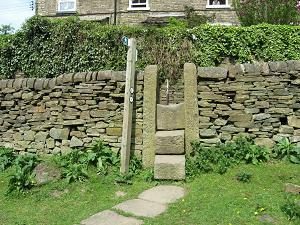 There is a very fine example of a stone wall crossing stile in Redway (left). This street is in the Kerridge Conservation Area. Numbers 2-40 and 1-5 are subject to Article 4 Direction. The links are all to the Images of England web site provided by Historic England. White Nancy monument ; II, Kerridge Hill, access via Redway, Folly/summerhouse, erected 1817 for John Gaskell junior.